This is a refreshing and easily prepared cake for the summer months (or any other time of the year!) prepared with Greek strained yoghurt. Although it can be eaten warm straight from the oven, it is best eaten when it is cold. Put the eggs, sugar and grated peel in a bowl and beat well with a hand whisk. Add the yoghurt and beat well until it is well mixed. 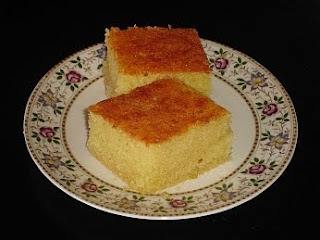 Set aside 1 tbsp of semolina and put the rest in a bowl and add the almonds, vanilla, baking powder and salt. Mix well. Add this mixture to the yoghurt mixture and mix well. Take an oven dish 30cm diameter and 5cm deep, butter it and sprinkle the tbsp of semolina you have previously set aside. Put the mixture in the dish and bake in a preheated oven at 180 degrees Celsius for 30 minutes. In the meantime prepare the syrup by boiling all the syrup ingredients for 5 minutes. 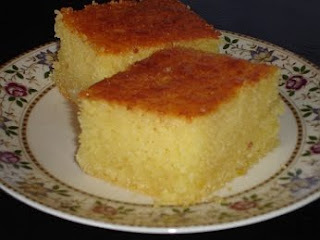 When the cake is ready, cut it into portions in the oven dish and pour the syrup over it. Remember, the cake should be hot when you do this and the syrup warm. Found you from Blogfrog. You've got interesting recipes. Great for learning Greek recipes. I'm following you. Thanks for the kind words Spoon and Chopsticks! Glad you enjoy the recipes. Is there a way to include cups & ounces for us across the ocean, parakalo?